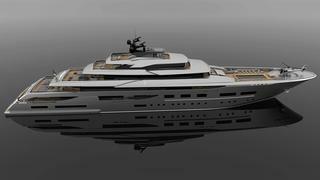 Teti is "based on the constant search for the right balance between internal and external spaces"
Zuccon Superyacht Design (ZSYD) has revealed a new 94 metre superyacht concept, known as Teti. The project is a new experiment from ZSYD, the superyacht division of the Zuccon International Project founded by husband and wife duo Giovanni Zuccon and Paola Galeazzi and their children. The family team works on a range of designs with four of the seven Ferretti Group brands. The designers said the Teti project is “based on the constant search for the right balance between internal and external spaces.” The design aims to provide large internal volumes, but not at the expense of the outside spaces and external lines. The upper deck is the focal point, “dedicated to guests and their entertainment”, with a large dining table, sun-pads and a pool area on the aft deck. There is a second large pool on the upper deck forward, surrounded by a large terrace with comfortable sofas for relaxing and enjoying the sun. One of the benefits of moving the guest-related activity to the upper deck is that it frees up the main deck to store an extra two 10 metre tenders, in addition to the two in the beach club. The floodable beach club features a float-in dock on the port side for one of the tenders, using a similar design to the one Zuccon employed on the innovative CRN J’ade. The final tender can be hosted in a more traditional garage on the starboard side. The seven deck Teti also has an owner's deck reachable via a private staircase. This deck has two owner’s suites, which Zuccon believe would be ideal for charter. The owner’s suites both have an exclusive studio and walk-in-closets. Eight more en-suite guest cabins can be found on the main deck and lower deck. 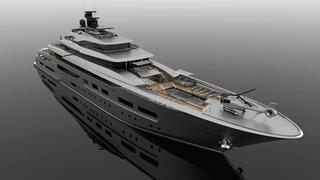 The 94 metre concept Teti follows two other projects announced by Zuccon in the past few years. In 2013, Zuccon revealed a new 90 metre superyacht concept, with a design that focuses on vertical surfaces resulting in a yacht with a sharp and captivating profile. 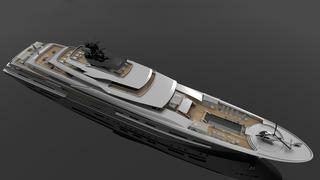 It has also presented designs for a 92 metre yacht.